Restaurant Cleaning - Hydro-Clean Services, Inc. Restaurant Cleaning - Hydro-Clean Services, Inc. Maintaining a restaurant is a full-time, dedicated position. In order for the restaurant to run smoothly and efficiently, items in the restaurant (and the immediate area) need to be in proper order, function adequately, and also be clean, sanitary, and attractive. Hydro-Clean Services, Inc. has many services available to help you maintain a properly working restaurant. We welcome the opportunity to work with you, as we assist you with cleaning the exterior of your eating establishment, as well as improving the environment within the kitchen, itself. Most people believe that an attractive restaurant, from the outside, is also going to be more attractive on the inside. When a customer approaches a restaurant, he/she is more likely to enjoy their dining experience if they know that the place is well taken care of and maintained with care. 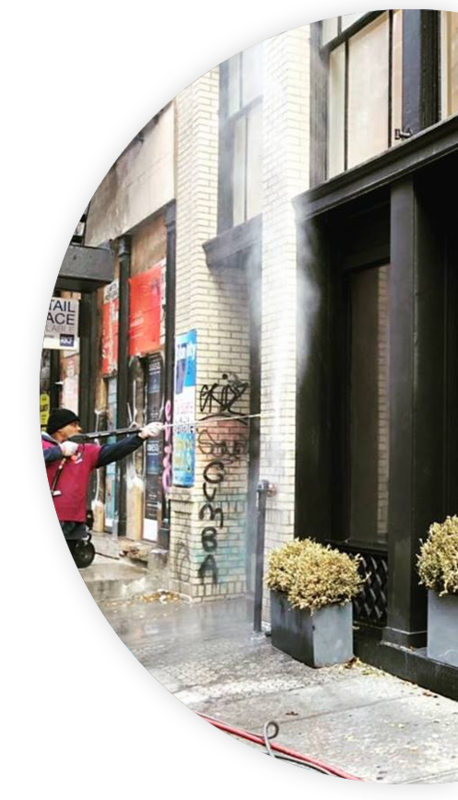 Hydro-Clean Services, Inc. offers pressure washing services that can help improve the appearance and the cleanliness of the exterior of your restaurant. Our team members are highly-qualified to pressure wash any type of exterior. Our advanced pressure washing machines, along with our effective, yet environmentally-friendly cleansers, will rid your establishment of unwanted dirt and grime that can so often be a deterrent for prospective customers. In addition to assisting in maintaining the outside of your restaurant property, our team is also qualified to help maintain your kitchen. Our team specializes in cleaning vent-a-hoods, which can be quite a fire and safety hazard if left unattended for extended amounts of time. The accumulation of grease and cooking debris can easily clog parts of the vent-a-hood system, which then becomes unsanitary and dangerous for your kitchen’s exhaust system. Our team members are trained to rid your vent-a-hood system of unwanted grease and debris and restore the vent to a healthy, fully-functioning system, once again. We will also properly dispose of the grease and buildup that is removed during the process. If you are managing a restaurant and would like some help with improving its’ indoor or outdoor environment, then give Hydro-Clean Services, Inc. a call today. Our specialty is helping restaurant owners/managers maintain the best possible environment for a thriving restaurant environment.